Hello Friends, Good morning. How was your night ? I'm sure you slept very well though and did you dream about me last night ? LOL. No, I guess. 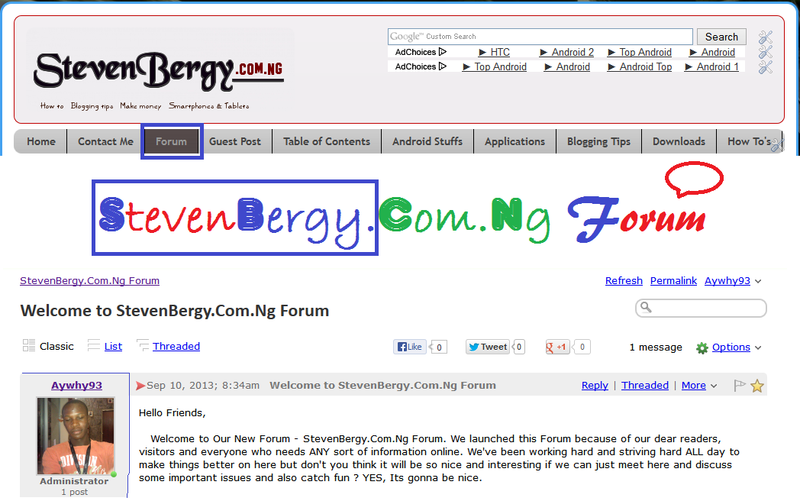 Well, Its a new day - September 10, 2013 and I will like to introduce you to our newly launched Forum -> Stevenbergy.Com.Ng Forum. We launched this Forum because of YOU; our dear readers, visitors and everyone who needs ANY sort of information online. We've been working hard and striving hard ALL day to make things better on here and I'm sure you all know that 'All work without play makes Rose a dull girl'.LOL.. Working hard goes along with playing hard and don't you think it will be so nice if we can just meet at our newly launched Forum and discuss some important things, share our experience and also catch some fun ? YES, Its gonna be so nice. 1. Science/Technology -- Programming, Computers, Smartphones, Graphics & Video. 2. Entertainment -- Jokes, TV/Movies, Music/Radio, Celebrities, Fashion, Events, Sports, Gaming, Literature. 3. General -- Politics, Romance, Business, Investment, Jobs/Vacancies, Career, Education, Automobiles, Health, Travel, Family, Culture, Religion, Food. Now, You can start by Registering on this Forum by clicking on the REGISTER link at the top right hand then verify your EMAIL (just a minute) and start posting interesting topics, reply to other topics, start making friends and catch fun. I hope you will enjoy this newly introduced Forum and before i leave, i will also like to let you know that members that are most active in this Forum will have the opportunity to become moderators and get featured on StevenBergy.Com.Ng as time goes on. So kindly join this Forum, invite your friends, share the news and God Bless you all as you help in making this Forum a success. Have a great day, Cheers !! !